1. Myrtle Geneva4 Sexton (Clyde Collins3, Benjamin Franklin2, Benjamin Franklin1) was born 01 Dec 1930 in Luxora, Mississippi Co., AR, and died 14 Jan 1993 in Osceola, AR1. She married Robert Bernard HOLTHOUSE 08 Aug 1952 in Osceola, AR, son of Bernard Holthouse and Nelle WILLIAMS. He was born 08 Dec 1922 in Muncia, IN, and died 28 Nov 2005 in Osceola, AR. Mrs. Myrtle Sexton Holthouse, 62, of Osceola, died Thursday at St. Francis Hospital of Memphis. She was a member of St. Matthews Catholic Church and the owner/ operator of the Geranium Shop. She was the president of the Osceola Progressive Club and past presi¬dent of St. Matthews Alter Society. She was preceded in death by a sister, Callie Ellis. Survivors include her husband,_. Bob Holthouse of Osceola; two daughters, Shawn Chafin of Osceola and Kim Holthouse of Pasadena, Calif.; four sons, Ron Holthouse and Vince Holthouse, both of Osceola; Heath Holthouse of New York, N.Y. and Brian Hv th¬ouse of Denver, Cob. ; her mother, Helen Sexton of Osceola; four sis¬ter, Madie Brice of Memphis, Jo Wetsein of Alton, Ill., Libby Sexton of Osceola and Brenda Cobb of Tunica, Miss. ; one brother, Son Sexton of Osceola; and seven grandchildren. Funeral services will be Sunday afternoon at 2 at St. Matthews Catholic Church with Rev. Father Joseph Pallo officiating. Burial will follow in Mississippi County Memo¬rial Gardens in Osceola. Roller-Swift Funeral Home of Osceola is in charge of arrangements. Visitation will be from 7 to 9 Saturday evening at the funeral home. In lieu of flowers, the familyre¬quests that lasting memorials be made to St. Matthews Catholic Church of the Osceola Progressive Club. Robert B. "Bob" Holthouse, 82, of Osceola, died Thursday, November 28, 2005 at the Great River Medical Center in Blytheville. Born Friday, December 8, 1922 in Muncie, IN to Bernard G. Holthouse and Nell Williams Holthouse he was a member of the Osceola St. Matthews Catholic Church. Bob’s father moved his family to Lawrenceburg, TN in the early 1920’s where he opened a factory that made wood handles and ball bats. He graduated from Lawrenceburg High School and entered Purdue University in the fall of 1941. Deciding to take a break from his studies, to serve his country during WWII, he enlisted in the Air Force. Returning to college he graduated from University of Tennessee and worked for Purina before moving to Mississippi County in 1950. He began farming in the Manila area moving his operations to Osceola in 1958. Bob was well known throughout the county being active in local politics, Farm Bureau president in 1971, serving on the Quorum Court/Justice of the Peace, and on the Home Oil Company Board of Directors. Church, family, reading and scuba diving are only a few of his many passions. He is survived by his wife Marie Whitten Holthouse of Osceola; three sons: Ron Holthouse of Osceola, Brian Holthouse of Havre de Grace, MD and Vince Holthouse of Raleigh, N.C.; one step-son, Jim Lindsey of Adams, TN; two daughters: Kim Holthouse and Shawn Chafin both of Osceola; two step-daughters: Carol Logue of Brentwood, TN and Kathy Hayes of Lawrenceburg, TN; nine grandchildren and one great granddaughter. He is preceded in death by his parents; his first wife Myrtle Sexton Holthouse; one son, Edward Heath Holthouse; and three sisters: Margaret, Virginia and Maude. Memorial Gardens with Roller-Swift Funeral Home in charge of arrangements. Family request that memorials be made to St. Matthews Catholic Church or donor’s choice. Online guestbook www.rollerfuneralhomes.com/swift. .
2 i. Kimberly Ann5 Holthouse, born 14 Jun 1953 in Jonesboro, Craighead Co., AR. + 3 ii. Shawn Marie Holthouse, born 04 Jun 1955 in Blythville, Mississippi Co., AR. + 4 iii. Robert Bernard Holthouse, Jr., born 27 Apr 1958 in Osceola, Mississippi Co., AR. 5 iv. Edward Heath Holthouse, born 24 Dec 1959 in Osceola, Mississippi Co., AR; died 13 Dec 1994 in New York, , NY. 6 v. Brian Anthony Holthouse, born 15 Oct 1961 in Osceola, Mississippi Co., AR. + 7 vi. Vincent Nicholas Holthouse, Sr., born 05 Jul 1963 in Osceola, Mississippi Co., AR. 3. Shawn Marie5 Holthouse (Myrtle Geneva4 Sexton, Clyde Collins3, Benjamin Franklin2, Benjamin Franklin1) was born 04 Jun 1955 in Blythville, Mississippi Co., AR. She married (1) Gerald Finley Chafin, Jr. 14 Jul 1973. He was born 02 Mar 1954 in Osceola, Mississippi Co., AR, and died 08 Jun 1984 in Osceola, Mississippi Co., AR. She married (2) Donald Lindsey 21 May 1993. He was born 16 Aug 1956 in Osceola, Mississippi Co., AR. + 8 i. Gerald Finley6 Chafin III, born 29 Jan 1974 in Jackson, Hinds Co, MS.
9 ii. Robert Brandon Chafin, born 14 Jun 1976 in Russellville, Pope Co, AR. 10 iii. Chase Ashton Chafin, born 09 Dec 1982 in Memphis, Shelby Co., TN. He married Joanna Brooke Ford 09 Jun 2007; born 29 Jan 1983 in Jonesboro, Craighead Co., AR. 4. Robert Bernard5 Holthouse, Jr. (Myrtle Geneva4 Sexton, Clyde Collins3, Benjamin Franklin2, Benjamin Franklin1) was born 27 Apr 1958 in Osceola, Mississippi Co., AR. He married Deborah Hook. She was born 13 Dec 1958. 11 i. Robert Bernard6 Holthouse III, born 24 Sep 1985 in Osceola, Mississippi Co., AR. 12 ii. Adam Hugh Holthouse, born 08 Jan 1988 in Osceola, Mississippi Co., AR. 13 iii. Callie Elizabeth Holthouse, born 06 Aug 1991 in Osceola, Mississippi Co., AR. 7. Vincent Nicholas5 Holthouse, Sr. (Myrtle Geneva4 Sexton, Clyde Collins3, Benjamin Franklin2, Benjamin Franklin1) was born 05 Jul 1963 in Osceola, Mississippi Co., AR. He married Kay Jackson 23 Nov 1985. She was born Abt. 1963. 14 i. Taylor Elaine6 Holthouse, born 12 Apr 1992 in Osceola, Mississippi Co., AR. 15 ii. Vincent Nicholas Holthouse, Jr., born 07 Apr 1995 in Osceola, Mississippi Co., AR. 8. Gerald Finley6 Chafin III (Shawn Marie5 Holthouse, Myrtle Geneva4 Sexton, Clyde Collins3, Benjamin Franklin2, Benjamin Franklin1) was born 29 Jan 1974 in Jackson, Hinds Co, MS. He married Christine Jones 07 Aug 1999. She was born 11 Sep 1975 in Harlingen, Hidalgo Co, TX. 16 i. Laurel Marie7 Chafin, born 22 Jan 2004 in Denver, Denver Co, CO.
17 ii. Ginley Jones Chafin, born 29 Sep 2006 in Little Rock, Pulaski Co, AR. 1. Myrtle Geneva Sexton, born 01 Dec 1930 in Luxora, Mississippi Co., AR; died 14 Jan 1993 in Osceola, AR1. She was the daughter of 2. Clyde Collins Sexton and 3. Helen Lee Cole. She married (1) Robert Bernard HOLTHOUSE 08 Aug 1952 in Osceola, AR. He was born 08 Dec 1922 in Muncia, IN, and died 28 Nov 2005 in Osceola, AR. He was the son of Bernard Godfrey Holthouse and Nelle Frances WILLIAMS. 2. Clyde Collins Sexton, born 25 Jul 1908 in Berry, Tucaloosa County, AL2; died 15 Mar 1958 in Gilmore, Mississippi Co., AR. He was the son of 4. Benjamin Franklin Sexton and 5. Emily Francis Harold. He married 3. Helen Lee Cole 23 Jul 1929 in Luxora, Mississippi Co., AR. 3. Helen Lee Cole, born 13 Jul 1909 in Ridgley, , TN; died 1999 in Blytheville, AR. She was the daughter of 6. Hubert Jackson Cole and 7. Callie Jowers. Sonny got the tractor stuck out in the field and came and got Uncle Clyde to get it unstuck but the tractor turned over on him and killed him. His last words were Sonny take Helen and the girls to church every Sunday. 1 i. Myrtle Geneva Sexton, born 01 Dec 1930 in Luxora, Mississippi Co., AR; died 14 Jan 1993 in Osceola, AR; married Robert Bernard HOLTHOUSE 08 Aug 1952 in Osceola, AR. ii. Madie Laverne Sexton, born 24 Jan 1933 in Luxora, Mississippi Co., AR; married Wendell M. Brice 29 Jul 1951 in Blythville, Mississippi Co., AR. iii. Mary Jo Sexton, born 04 Sep 1935 in Luxora, Mississippi Co., AR; married Edward Wetstein 24 May 1957 in Alton, , IL. iv. Callie Mae Sexton, born 03 Dec 1937 in Luxora, Mississippi Co., AR; married William J. Warren 08 Apr 1960 in Memphis, Shelby County, TN; born Abt. 1937.
v. Clyde Benjamine Sexton, born 09 Aug 1939 in Luxora, Mississippi Co., AR; married Barbara Prescott 17 Jan 1962 in Marian, , AR; born Abt. 1939.
vi. Elizabeth Rovene Sexton, born 05 Aug 1944 in Luxora, Mississippi Co., AR; married (1) Don R. Brewington 02 Dec 1956 in Corinth, , MS; born Abt. 1944; married (2) Wayne Strutu 27 Nov 1970 in Osceola, Missiissippi Co., AR; born Abt. 1944.
vii. Brenda Kay Sexton, born 17 Jun 1949 in Luxora, Mississippi Co., AR; married Bradford Cobb II 25 Jul 1970 in Osceola, Missiissippi Co., AR. 4. Benjamin Franklin Sexton, born 13 Oct 1870 in Tucaloosa County, AL; died 09 Jan 1952 in Tucaloosa County, AL. He was the son of 8. Benjamin Franklin Sexton and 9. Mary Jane Sartain. He married 5. Emily Francis Harold 1933. 5. Emily Francis Harold, born 14 Mar 1875 in Tucaloosa County, AL; died 22 May 1951 in Tucaloosa County, AL. i. Ethel Sexton, born 20 Jan 1893.
ii. William B. Sexton, born Mar 1895; died Aug 1939.
iii. Ulysus Grant Sexton, born 1897; died 07 Feb 1932.
iv. Webster Earnest Sexton, born 1898; died 17 Apr 1964.
v. Goldman Sexton, born 1899; died 1899.
vi. Lillian Sexton, born 1900; died 18 Jun 1992.
vii. Melisa Elizabeth Sexton, born 1904; died Jun 1992.
viii. Clay Sexton, born 1906; died 1908. 2 ix. Clyde Collins Sexton, born 25 Jul 1908 in Berry, Tucaloosa County, AL; died 15 Mar 1958 in Gilmore, Mississippi Co., AR; married Helen Lee Cole 23 Jul 1929 in Luxora, Mississippi Co., AR. x. Claude Harrald Sexton, born 17 Sep 1911.
xi. Clarence Sexton, born 10 Apr 1914.
xii. Vera Mae Sexton, born 28 Mar 1916. 6. Hubert Jackson Cole3, born 13 Sep 1886 in Benton, Tennessee3; died 24 Oct 1959. He was the son of 12. Denis Jackson Cole and 13. Tyrica Pearl Key. He married 7. Callie Jowers. 7. Callie Jowers, born 21 Jan 1892 in Lake, Tennessee, USA4; died 22 May 19734. She was the daughter of 14. Adam Lafonte Jowers and 15. Beulah Tidwell. 3 i. Helen Lee Cole, born 13 Jul 1909 in Ridgley, , TN; died 1999 in Blytheville, AR; married Clyde Collins Sexton 23 Jul 1929 in Luxora, Mississippi Co., AR. ii. Hazel Cole, born 18 Feb 1910; died 12 Jul 1912.
iii. Viva Cole, born 26 Mar 1912; married Frank Borrello. iv. Irene Jo Cole, born 26 Mar 1914; died 03 Jan 1947.
v. Maudie Pearl Cole, born 14 Jan 1916; died 17 Jun 1917; married Howard McCain. vi. Rovene Cate Cole, born 04 Mar 1919; married Eddie B. Davis. vii. Marjori Pearl Cole, born 02 Oct 1921; died 26 Mar 1922.
viii. Hubert Jackson Cole, Jr, born 04 Feb 1924; died 28 Mar 1924.
ix. William Kenneth Cole, born 24 Mar 1925; died 05 Jun 1929.
x. Bonnis Virginia Cole, born 30 May 1924; married Woody Williford. xi. Millie Joan Cole, born 09 Jul 1931; married E. J. Baker, Jr..
xii. Billy Jo Cole, born 30 Oct 1933; died 09 Aug 1934. 8. Benjamin Franklin Sexton, born Oct 1835 in Tucaloosa County, AL; died 1931 in Gordo, AL. He married 9. 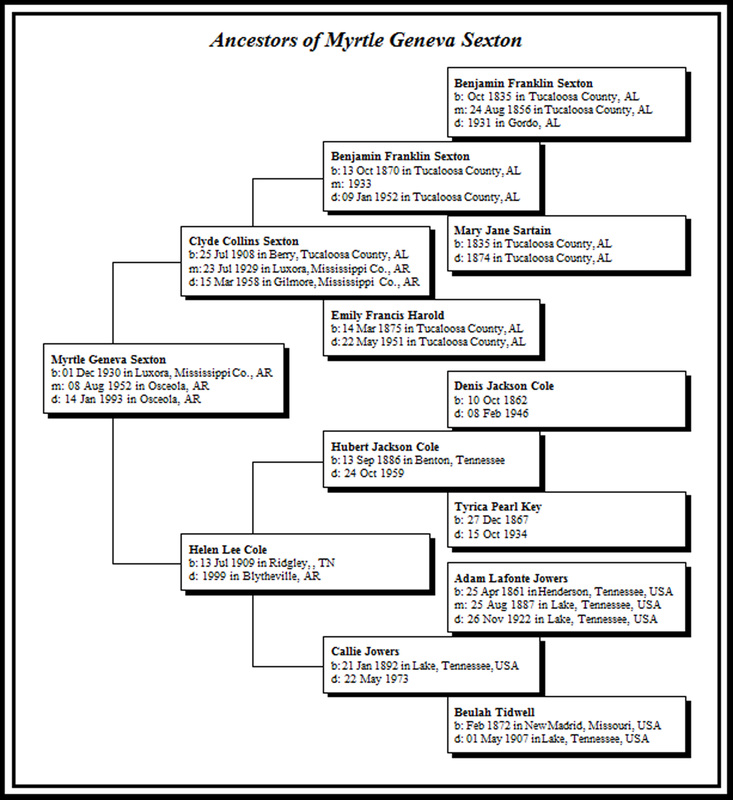 Mary Jane Sartain 24 Aug 1856 in Tucaloosa County, AL. 9. Mary Jane Sartain, born 1835 in Tucaloosa County, AL; died 1874 in Tucaloosa County, AL. 4 i. Benjamin Franklin Sexton, born 13 Oct 1870 in Tucaloosa County, AL; died 09 Jan 1952 in Tucaloosa County, AL; married Emily Francis Harold 1933. 12. Denis Jackson Cole, born 10 Oct 1862; died 08 Feb 1946. He married 13. Tyrica Pearl Key. 13. Tyrica Pearl Key, born 27 Dec 1867; died 15 Oct 1934. 6 i. Hubert Jackson Cole, born 13 Sep 1886 in Benton, Tennessee; died 24 Oct 1959; married Callie Jowers. ii. William Virgil Cole, born Aug 1889; died 01 Apr 1941.
iii. Dovie Lee Cole, born 01 Oct 1891; died 19 Jan 1973; married Fnu Stanfield; born Abt. 1891.
iv. Thomas Jefferson Cole, born 05 Dec 1892; died 27 Sep 1967.
v. Josephine Cole, born Jul 1894; died 07 May 1907.
vi. Rosa Jane Cole, born 05 Feb 1897; died 1983.
vii. Cecil Cole, born Abt. 1898; died Abt. 1898.
viii. Era Verlie Cole, born 25 Feb 1900.
ix. Verna Lee Cole, born 17 Jun 1908.
x. Woodrow Wilson Cole, born 10 Dec 1911; died 20 Oct 1921. 14. Adam Lafonte Jowers7, born 25 Apr 1861 in Henderson, Tennessee, USA7; died 26 Nov 1922 in Lake, Tennessee, USA7. He married 15. Beulah Tidwell 25 Aug 1887 in Lake, Tennessee, USA7. 15. Beulah Tidwell7,8, born Feb 1872 in New Madrid, Missouri, USA9; died 01 May 1907 in Lake, Tennessee, USA9. i. Norman Clyde Jowers, born 22 Mar 1891 in Lake, Tennessee, USA; died 16 Sep 1951 in , , TN. 7 ii. Callie Jowers, born 21 Jan 1892 in Lake, Tennessee, USA; died 22 May 1973; married Hubert Jackson Cole.